This is a collection of quotes and teachings on Holika Dahan explaining the meaning and significance of lighting fire on Holi. Sage Narada talks to Yudhishtira about the importance of Holika Dahan on Phalguna Purnima day. Puranas are full of colorful illustrations and stories and there is a story related to Holi. An asura king, Hiranyakashipu, wanted everyone to worship him. But his son Prahlad was a devotee of Lord Narayana, the king’s sworn enemy. Angry, the king wanted Holika, his sister, to get rid of Prahlad. Empowered to withstand fire, Holika sat on a burning pyre holding Prahlad on her lap. But it was Holika who was burnt, Prahlad came out unharmed. Hiranyakashipu symbolizes one who is gross. Prahlad embodies innocence, faith and bliss. The spirit cannot be confined to matter, only love. Hiranyakashipu wanted all joy to come from the material world. It did not happen that way. The individual jivatma cannot be bound to the material forever. It’s natural to eventually move towards Narayana, one’s higher Self. Holika symbolizes past burdens that try to burn Prahlad’s innocence.. But Prahlad, so deeply rooted in Narayana Bhakti, could burn all past impressions (sanskaras). For one who is deep in bhakti, joy springs up with new colors and life becomes a celebration. Burning the past, you gear up for a new beginning. Your emotions, like fire, burn you. But when they are a fountain of colors, they add charm to your life. 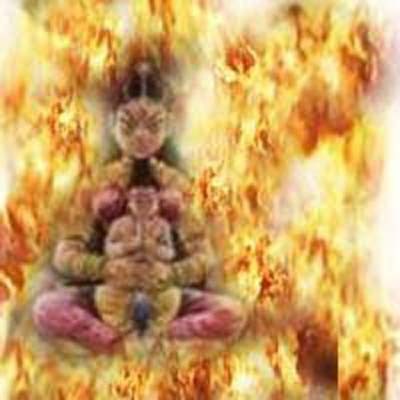 Demon Holika sat inside fire holding young Prahlad on her lap. But it was Holika who was burnt; Prahlad came out unharmed from fire. Is this just another story of good winning over evil? No! Look deep and we will find that demon Holika represents the unwanted desires, anger, jealousy, ego, pride, and greediness in us that multiplies daily. We are burning the ignorance that has enveloped us. When impurities are cleared we become child Prahlad – free from attachment or hatred – we regain childlike pure nature – we become truth – Satchidananda. Holika is not a woman but symbolically represents ignorance – desires, ego, avarice, jealousy, anger which constantly multiplies in us. Why Holika is a woman and not a male demon? Only a woman can reproduce. And we regularly reproduce our desire, ego, anger, frustration, avarice and jealousy. This piles up and covers the pure self. Childlike pure nature is covered with everything unwanted. On Holika Dahan we burn out all impurities. When the impurities are removed we rediscover the Prahlad in us. The child Prahlad celebrates Holi the next day with color – celebration of innocence and purity.